Ann Handley, the Chief Content Marketing Officer at MarketingProfs is a Wall Street Journal best-selling author, keynote speaker, and the world’s first Chief Content Officer. Ann has been writing and consulting on content marketing for almost 20 years, and was one of the first practitioners to recognize the power of creating content to engage customers. Given how important content has been to growth at Intercom, I was excited to catch up with Ann recently to talk about a range of content marketing topics. Our conversation covered empathy in marketing, the importance of engaging content, the unique challenges of B2B marketing, and the importance of metrics. For the readers amongst you, a lightly edited transcript of my conversation with Ann follows below. Sara Yin: It’s great to have you on the show Ann. For the sake of our audience, could you please introduce yourself? Ann Handley: Sure. I am the Chief Content Officer at MarketingProfs which means that I head up all content that is on our website. We are a training and education company with the largest number of marketers in our category. We have about 600,000 subscribers to our email list. We try to help businesses use social, content and digital tools to market more effectively. I’m also the author of a couple of books about content marketing. One is called Content Rules, your guide to creating content on behalf of your business which is published by Wiley and came out in 2010. My second book, called Everybody Writes: Your Go-To Guide to Creating Ridiculously Good Content came out almost a year ago. It’s a Wall Street Journal best seller. Sara: I highly recommend it. It’s up there on my shelf with the Elements of Style. Ann, you’ve been writing about content marketing for about 20 years now. I’m curious what the light bulb moment was for you when you realized the power of the discipline? Ann: 20 years; that makes me sound like a relic. Yeah, I guess it actually has been that long. I started my career as a journalist, as a writer and editor, primarily in the B2B space. I founded a website called ClickZ, which in 1997 was one of the first sources of online information as it relates to marketing. It was actually pre-email marketing. It was a time when all we were writing about was banner ads and creating websites to sell your products and services online. My whole career has always been about creating content to engage audiences. I realized about seven or eight years ago, that all businesses who are doing business online, are all publishers. We’re all trying to get in touch not just with customers, but to build audience. I never considered myself a marketer. I always thought of myself as an editor and a writer first, but I realized that what I had been doing in that field – in the B2B space around marketing information – was actually directly relevant to what every marketer at every organization needs to be thinking about. That was really an “Aha” moment for me, where I thought, “God, I’ve been creating content to build relationships with individuals to build audiences for my entire career.” That’s essentially what we all, as business owners, as startups, as businesses need to be doing as well. Sara: That’s funny because that’s kind of how I saw myself coming from a journalist to the marketing field. I didn’t think of myself as a marketer but someone who was trying to engage an audience. Ann: I think the best marketers these days know that. They understand that you need to be thinking about that relationship with a prospect first before you think about them as a customer. To really think about things from an audience centric point of view, what people like us who have journalism backgrounds have always done, and really transfer that into the business world. Sara: Related to that you talk a lot about the need for empathy in content marketing. Why is empathy so important if you are trying to create effective content? Ann: Empathy means just thinking about things from another’s point of view, at least from a business perspective. Thinking of things with empathy for the experience that you’re creating for the customer is really important. We need to be thinking about things from a customer point of view, not a company centric point of view. Many marketers, they have grown up on the marketing positioning ranks. They’ve lots of practice in messaging and getting out your corporate centric messages. But in modern marketing we can’t do that anymore. We really do have to be thinking from a customer point of view and not a corporate point of view. How can I can create something that is going to really be useful to the person that I’m trying to reach? How to create things that they want, not just that I think they want. My friend Tom Fishburne has a great quote which I talk about all the time on stage; “The best marketing doesn’t feel like marketing.” That’s absolutely true. I think the best marketing feels like something that people want or need or will enjoy. It doesn’t feel like marketing. Sara: I read something about how you often measure the quality of content by how many “thank yous” you get from customers, which I thought was a great measure of ROI. Ann: Yeah. It’s sort of a soft measure, but I think it’s a great way to think about what you’re creating. We do this at MarketingProfs, my company, all the time. When we create something, we think, “Will our customers thank us for this?” I think it’s important for all of us to be thinking about whatever marketing we’re creating, is it really useful to our customers? Will they thank us for it? I think if you think of things through that lens, it just clarifies what you’re doing in such a simple, elegant way. Sara: This is pretty challenging for marketers in the B2B space especially, where it can be pretty difficult to relate to customers whose jobs are so different to our own. I wonder do you have any advice for the B2B marketing space specifically? Ann: The best B2B marketing content really thinks of things from that customer point of view, but maybe a little bit more broadly, too. I’m speaking next week at a conference to a bunch of folks who are responsible for marketing technologies, so I’ve been trying to find examples of companies who do this really well. One of the companies that has bubbled up for me is Slack. What I love about what they’ve been doing on the content side, is that they recently launched a podcast called the Slack Variety Pack. It’s a fantastic example of creating content that does a couple things. First of all, it definitely has empathy for the audience in the sense that it really is thinking about things from their point of view and not from the Slack point of view. The second thing that I really love about it, is that it tells a bigger story. The podcast is not about technology. It’s not about Slack itself. It’s not about how you could use Slack more effectively, for example, which would be a classic marketing play. Instead, it’s a podcast about work, life and everything in between, as they say. They try to make work life less like work. They try to make it more enjoyable. That’s their bigger story. They understand that you’re going to spend 8+ hours a day at work, so how can we make it more fun? They offer stories on innovation in the workplace, modern culture in the workplace, then also just people who have found their lives work, or people who are on a journey to find their purpose; that kind of thing. It’s really giving work meaning and putting Slack in a much bigger context. It’s really about work itself, which Slack, of course, enables. It’s aligned with that purpose, but at the same time it’s not about it. You know what I’m saying? Sara: Whenever you think about work, productivity, or workplace issues, you might think about Slack? Ann: Right. That’s what they’re trying to do. I think it’s a brilliant play and a really great example of telling a bigger story. Not just talking about your own products and services, but putting those in context. Why should my customers care about this? It’s putting your product in the context of the way that it actually touches people’s lives. Sara: Do you have any advice for how other companies can find these big, big bold stories that you often talk about? Ann: There’s a couple things that come to mind for me. The first thing is definitely finding that bigger story. Putting your product in a bigger context. What do you do? In what ways does your product touch the lives of customers? Does it improve their lives in any way? Really, why do you exist? Grow your bigger story out of that. There’s obviously a million different ways you can go with that, but this is a great opportunity to get everybody in a room, brainstorm on a whiteboard or on a flip chart, and just say, “What is it that we’re really all about? What’s our bigger purpose?”. My friend Mark Schaefer has a great way of getting to this. He says, “Answer the question, ‘What is it that only we do?”. In Slack’s case it may be, “We make work as fun as it can possibly be”. Whatever that is, just try to be the only one who does that. Don’t commoditize what that thing is. There’s always going to be somebody who’s less expensive than you, who’s faster, cheaper; whatever. Instead, what you want to do is really tell that richer story to inspire people to get involved in your story. Sara: Going beyond just creating great content it’s equally important to get it out there and make sure people discover it – like you found Slack’s podcast even though there are tonnes of other great podcasts out there. I’m also curious how you view the role of promotion – both paid and unpaid – in content marketing. Ann: Promotion is obviously a huge piece of this. Great content is really table stakes these days. I don’t think you can afford to produce anything less than that. The other piece of that, of course, is that we’re past the age where if you build it, they will come. You do have to have some sort of promotional program in place. MarketingProfs and the Content Marketing Institute recently came out with our new B2B research study. 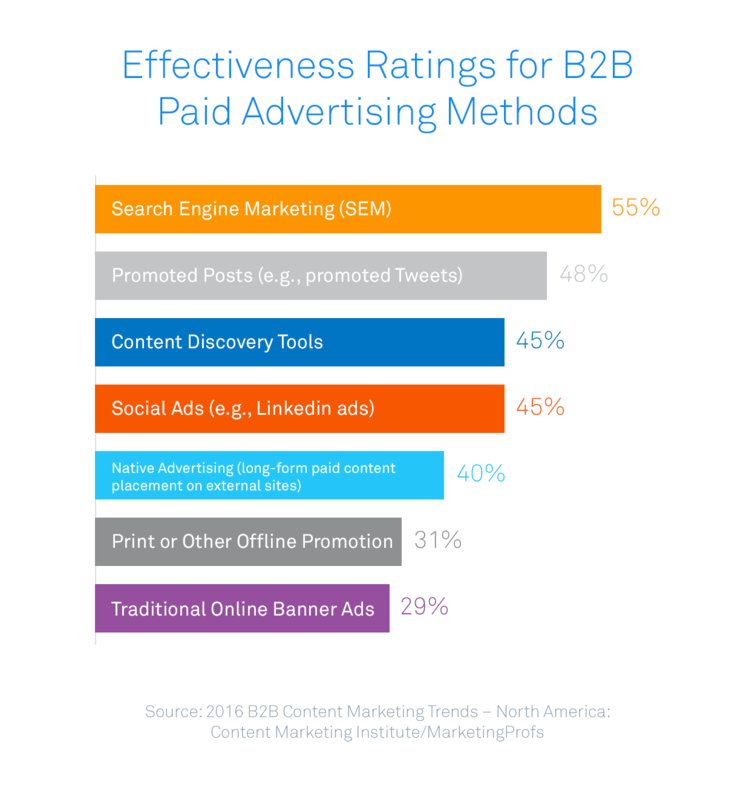 We asked B2B marketers which paid advertising methods they were using to either promote or to distribute their content? Search engine marketing, as usual, is right at the top. Then also things like social ads started to bubble up, like LinkedIn ads, using promoted posts or promoted tweets. About fifty- two percent of B2B marketers are using them. Native advertising also started to come up in a significant way this year. Then, finally we found that a lot of B2B marketers are also using some sort of content discovery tool; like Outbrain, or something like that, just to get their content in front of other audiences. Sara: That’s interesting because I always feel the B2B space is a few years behind what’s being done in the e-commerce space with regard to advertising. Ann: I’m not sure that’s the case anymore. Especially where you have a platform like LinkedIn, which is all B2B. They’ve made amazing inroads in terms of their network, using their platform to allow everybody to be a publisher on that network as well. 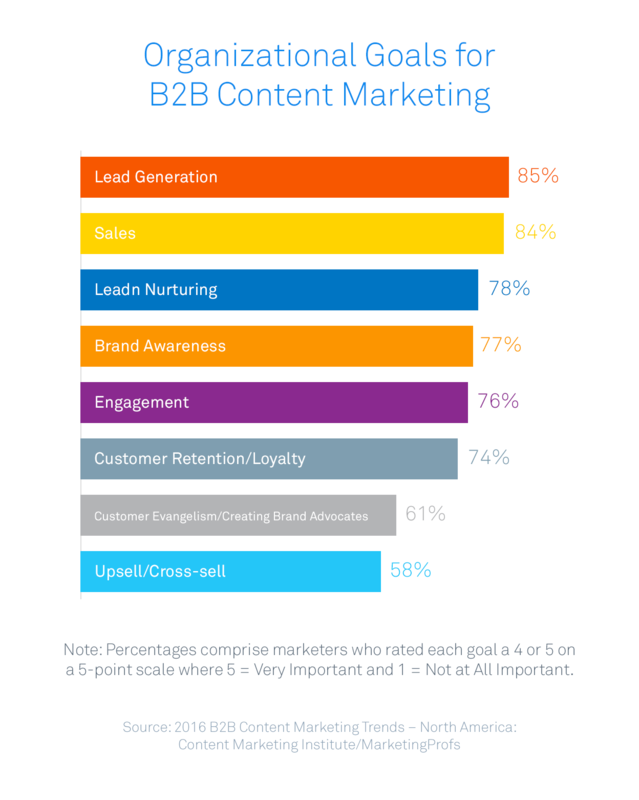 I do think that B2B is really catching on this, at least the marketers who are engaged in content marketing. I think there a significant number of marketers are using some sort of either paid, or some sort of promotion, with their content as well. Sara: Let’s switch gears a bit. A common critique we hear of content marketing is it doesn’t scale well without sacrificing quality. What’s your take on this? Ann: I don’t really know that I buy that, to be truthful with you. I think there’s some inherent tension between quality and quantity. Very often when I start to hear people say, “You know, we just can’t scale quality,” I really think what they mean is, they’re doing too many things. That’s what that says to me. If you are on LinkedIn and Facebook and Twitter and Pinterest, and if you’re publishing a blog and eBooks and and white papers and webinars and you feel you can’t do everything well, my advice would be, “Don’t do everything.” Start to pull back a little bit. Figure out what’s working for you and double down on those particular platforms or those particular tactics, and stick to the quality. When the quality isn’t there, that’s the fastest way to convince people to hit the back button. Make sure that what you’re producing really has empathy for the customer you’re trying to reach, that offers them something useful and valuable and that is inspired by data, or creatively inspired. Sometimes, quality and quantity are definitely allergic to one another. You think about things like restaurants. If you go to a restaurant where there’s hundreds of them across the US, chances are, the quality is not going to be up to par. We see it in a marketing context, in email lists, for example. The bigger your email list, the less responsive it is. I think quality content can scale, but that means you have to get the basics right. Sara: You’ve successfully scaled a team of content creators at MarketingProfs. I’m wondering what you’ve been looking for as you’ve added to the team? Is it just great writers? A bunch of former journalists? Ann: Most of the text content that we produce at MarketingProfs is actually produced by guest writers; guests who come to MarketingProfs because they want to get in front of our audience. What I focus on is hiring great editors. I want to hire people who can help writers succeed with reaching the audience in a way that’s going to connect with them. Because all our editorial comes from outside contributors, that means the filter content has to go through has to be really great. Sara: That’s funny – that’s what I’ve found myself doing a lot more these days as a content marketer. I was hired as a journalist so I could write but it very quickly becomes an editing position. We’ve found content means different things to different people and can touch on many different areas of the marketing strategy from demand generation to customer success to events and even to PR. How do you think marketing leaders should be thinking about content in relation to their organisational structure? Ann: There’s really no one way to think about the function of content within an organization. Through that research study I just mentioned, we found some companies have content as a function of the marketing team, and everything the company puts out goes through that team. Sometimes it’s sort of a content center of excellence that stands alone within the organization. Sometimes it looks like just a single, lonely little chief blogging officer or chief content officer. There’s no one answer to that. The most important thing, of course, is to really start with why. Why are we doing what we’re doing and what are we hoping to achieve with what we’re doing?. Build out your team from there. For example, if your notion is to use content marketing to drive leads, then that person should be linked to the marketing team. Sara: I’m hearing you say content is almost experimental in a way. You have to create stuff, see what sticks the most with your audience, and then just keep doing more of that? Ann: Yes. I would say, especially if it’s a new program, you’ve got to start somewhere. Again, I always start with why. Figuring out what we are trying to accomplish with the content that we’re creating? Then wrap some goals and some metrics around that. How are we going to know that this is successful based on what it is we’re trying to do? Really think about those things first. From there, put a content program around it and start producing content depending on what it is you’re trying to do. Iterate from there. I’m not sure if I would use the word experimental as much as I would say it’s an evolution. You’re probably not going to start creating content right out of the gate and hit it out of the park. I think it is important to always be looking at your metrics; figuring out, if you’re movong the needle or not. Are we attracting the right people? Really looking at that lead quality matched up with your personas. Make sure you have personas in place, constantly iterate on them. Are these assumptions that we’re making about who we’re reaching with this particular content? Is this actually working? It’s a little bit of an art and it’s a little bit of a science. Sara: Do you think there are any types of companies that should not be doing content marketing at all? Ann: I hate to say categorically that there is absolutely no company out there that shouldn’t be doing content marketing. At its core, content is really just the voice that you’re giving the organization. It’s really just a way that you are speaking with your customers. I can’t imagine a company out there who doesn’t want to speak to their customers, but maybe it exists. I can’t say that I’ve ever met that particular organization. It’s just trying to talk to customers. You’re trying to help them make decisions. You’re trying to coach them. That’s all content is. I guess the question to ask yourself is, “Do you need a website?”. If you don’t need a website, then I would say you probably don’t have some sort of content play. Although now I’m also disagreeing with that because I was thinking you could also do a print publication. Anyway. I’m going to let you know. I’m going to get back to you on that one. Sara: Last question. Where do you think the biggest opportunities lie for content marketers? Ann: There’s just so many opportunities for content marketers. I don’t know. I think they’re everywhere. I think the obvious answer is to say video. I think there’s such amazing strides that have been made in video, even in past few years. I think video is definitely an untapped resource for a lot of companies. On the other side of the spectrum, there’s also a lot of companies who, for the first time, are thinking about writing in new and different ways. We’re starting to see marketers pay more attention to the tone of voice in their writing, and the words that they’re using on the website to convey. It’s not just information, but a little bit of personality and a little bit of who they are. That doesn’t mean that you’re writing has to be cheeky or snarky or flippant. Really what it means is that you’re communicating, with empathy. That you’re really thinking about who you are, and then using the words to speak to your audience in a way that they would recognize you. I was at Content Marketing World this year and there were 3500 marketers there. That’s a big crowd. I’ve spoken there for five years. The first year, I think there was 900, so it’s definitely exploded. At the same time, I still think that the opportunities are vast, and I still think that the opportunities are deep. There’s still a lot of room to grow in content marketing. I’m excited to see what we do next. Sara: I thought it was very interesting the timing of your book Everybody Writes. It dropped just last year, and it’s such a fundamental book – how to write well. I thought it was interesting, that there’s always that challenge as well; that opportunity is to stand out from the crowd just by writing better. At Inbound, I shared a story about a B2B agency. One of the ways they think about their content is that if the label fell off, would you recognize it as theirs?. In other words, look at your own website. If you stripped away all the branding, if you took off your logo, if you took away anything that identified it as you visually, would it sound any different than your competitors? Very often, the answer is no. I think that’s a really powerful test for all companies to do. Do we recognize ourselves if we tear the label off? I do think that that’s where we’re seeing companies going and that’s what I tried to do with Everybody Writes. It’s really inspire people to just use their words better. They are the ambassadors for your company, so use them better and value them more. Sara: That’s great. One of our challenges is trying to get other voices within the company on to our blog. We love seeing engineering posts, or sales people writing stuff, or the finance people. Ann: Yeah, and helping them figure out how to write in a way that’s sort of relaxed and that is going to connect with the folks they’re trying to reach. I remember reading a blog post on the Intercom blog not too long ago, actually. It was written by your editor there, John Collins. He was sharing how he coaches engineers to write in a way that’s much more direct and efficient. As a result, instead of doing a lot of lead up and clearing their throat and dancing around, he just says, “Get right in to it and use strong, colorful language.” That’s very much what I tried to do with Everybody Writes.